From our British farms. Cooks in 25 mins. The Gressingham Duck® is a unique breed that first came about when the flavourful Mallard was crossed with the larger Pekin duck, now renowned for its superior taste and succulence making it a favourite amongst restaurant chefs. 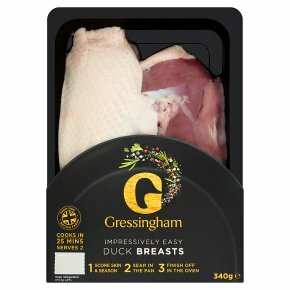 Gressingham Duck® is grown and packed on Red Tractor assured farms and factories in East Anglia. Preheat your oven to 200°C / Fan 180°C / Gas Mark 6 and remove all packaging.... 1 Score skin & season... ...Pat the skin of the duck breast with a kitchen towel to remove excess moisture. Score and season with salt and black pepper, if desired. 2 Sear in pan... ...Heat a frying pan on the hob over a medium to high heat without oil. Place the breast skin side down in the hot frying pan. Cook for 5 minutes until the skin turns golden brown; turn over and seal the meat for 1 minute. Pour off excess fat regularly. 3 Roast in oven... ...Place the duck breast skin side up on a baking tray in the middle of the preheated oven. Cook for 15-18 minutes, depending on how you like your duck cooked. When the duck is cooked to your liking, rest the meat in a warm place for 5-10 minutes before serving. All cooking appliances vary. This is a guide only. Dine in with our duck breasts.Pre-heat your oven to 200°C, Fan 180°C, Gas Mark 6 and remove all packaging.1. Pat the skin of the duck breasts with a kitchen towel to remove excess moisture, score and season with salt and pepper, if desired.2. Heat a frying pan on the hob over a medium to high heat without oil. Place the breasts skin side down in the hot frying pan. Cook for 5 minutes until the skin turns golden brown; turn over and seal the meat for 1 minute. Pour off excess fat regularly.3. Place the duck breasts skin side up on an ovenable dish in the middle of the pre-heated oven. Cook for 15-18 minutes, depending how you like your duck cooked.When the duck is cooked to your liking rest the meat in a warm place for 5-10 minutes before serving.All ovens vary in performance, this is a guide only.